Lakmini Wijesundera has over 24 years of experience in corporate governance, technology management and global expansion of enterprise ICT products and is the co-founder and Chief Executive Officer of IronOne Technologies and BoardPAC. These companies operate globally across 20 countries, the business has successfully collaborated forming international partnerships with leading companies in the telecom sector such as Maxis in Malaysia, Vodacom in South Africa, AirTel in India and Robi Axiata in Bangladesh among others. Lakmini has been recognized numerous times for her successful achievements. In 2017, she was selected as one of the 16 participants of the prestigious EY Entrepreneurial Winning Women of Asia Pacific 2017 becoming the first ever EY winning woman from Sri Lanka. In 2017 she was awarded the Most outstanding Woman exporter by the National Chamber of Exporters of Sri Lanka and the Export Development Board (EDB) while her companies won 5 awards ranging from the most outstanding ICT / professional services category company (across all sizes). In 2016, she was the recipient of the Special Award in recognition of Unique Entrepreneurship and Achievement in the field of exports by the National Chamber of Exporters (NCE) of Sri Lanka. In 2015, Lakmini received the Entrepreneur of the Year, Exporter of the Year and Gold Award in the large company category at the Entrepreneur Awards organized by the Women’s Chamber of Industries and Commerce (WCIC). 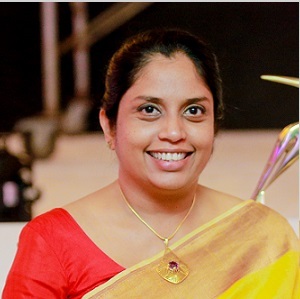 In 2014, the Computer Society of Sri Lanka (CSSL) awarded Lakmini, “Female ICT Leader of the Year,” and she was included in Echelon Magazines’ list of the 50 Most Powerful Women in business in Sri Lanka. In addition to her role in Ironone Technologies and BoardPAC, she holds several impactful roles as a Council Member and ICT sector head at the National Chamber of Exporters (NCE), a Non-Executive Board Director of Give2Lanka a charitable organization which helps bright underprivileged children in Sri Lanka to complete their schooling and university education. Prior to her entrepreneurial drive, Lakmini has worked in Lanka Bell and in Ceycom Global Communications in ICT engineering and Managerial positions and was a member and active contributor to the Lanka Bell corporate strategic team. Lakmini has a MSc in Communication and Signal Processing Engineering from Imperial College, University of London, United Kingdom and a BSc in Electronic Engineering and Computer Science from University College London, University of London, United Kingdom. Lakmini’s formative education for A-Level and O-Level has been in CMS Ladies College, Colombo, Sri Lanka.